In Northern California we started to get mosquitoes a few months ago and yuck! I CAN NOT stand those stupid bugs. They, on the other hand, adore me. I am always in a dilemma because as much as I hate mosquitoes, I also hate the sticky feeling and gross smell of traditional repellents. Not to mention the chemicals in those sprays which always make me uncomfortable- especially when I am spraying them on my little girls. 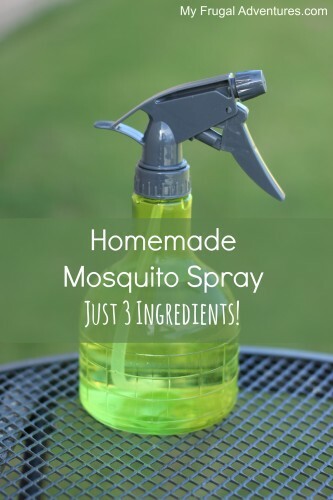 So I decided to give a DIY repellent a shot and I started checking out recipes online… Um… some of the recipes I found had a bunch of ingredients or required squeezing lemons or just seemed like a pain in the you know what to make. Not to mention lemon juice can give you sunburns so I wouldn’t want to use that to spray on my body in summer. I have two different ideas for you to make your own spray depending on what you prefer to use. 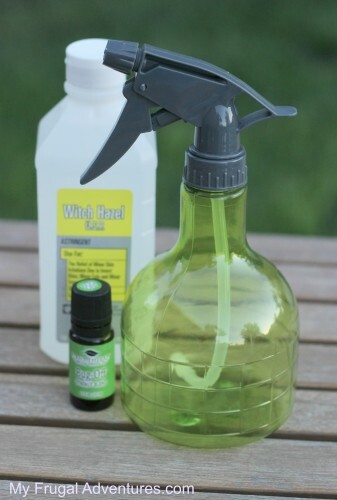 Here is the recipe I used- I added all of this to our little spray bottle. Note with essential oils you want to use glass bottles if possible (not plastic). I needed a spray and had this one hand but have since changed to glass. You might consider 20 drops for children or to spray clothing and furniture and stuff and up to 55 drops if you are going to a heavily infested area. And one important note- we all know normal bug spray can smell horrible. I find this spray much less offensive- it does have Citronella but I find the scent to be very mild. When I ordered the Bug Off here, it was about $7 which isn’t bad considering you can refill your spray a few times with this much oil. The prices on Amazon change all the time so just check back if it seems the price jumped up. 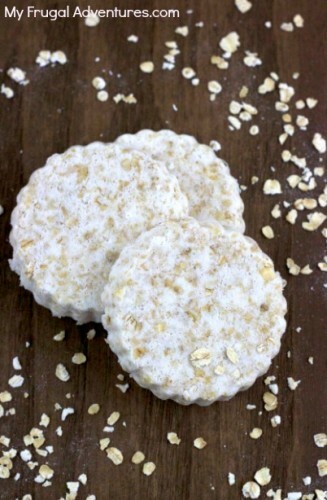 Oatmeal can be so good for the skin and here are some easy Oatmeal Bath Bombs– great for sunburns or irritated skin. Burts bees makes an all natural if repellent too. I think it was $7 or $8. I did a similiar search last summer and learned to use dryer sheets. I had a newborn and didn’t want to spray anything on him. I would just place them on his blanket around him or in his car seat with him. We also use them and rub them all over our skin. It has prevented mosquito bites and we smell good. I keep one of the small sizes of dryer sheets we got a few months ago for free in my diaper bag. Andrea- I have heard dryer sheets work! I read somewhere that someone suggesting putting them in your pocket. Great tip! Cali I have California Baby and Burt’s Bees repellents. Those are great options if you don’t want to make your own. I put it on in the evening before a night run and the stickiness makes me nuts. I think it that doesn’t bother you though those are a very easy solution. 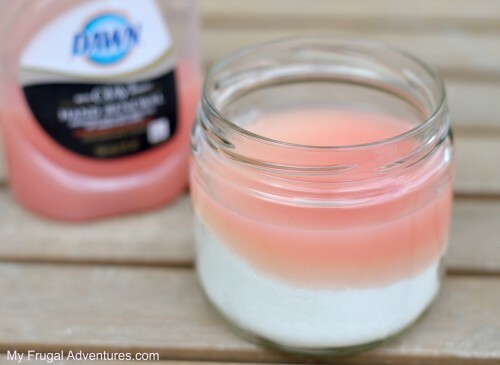 Skin so soft by avon works and so does the yellow listerine mouth wash works too. They both are good for kids too. Dryer sheets are loaded with chemicals. Great point Delaney! I know fabric softener is pretty dreadful and I am sure you are right on with the dryer sheets too. Skin so Soft is good for fleas on your dog & cats and it smells good. What is the Mouthwash recipe ? Thanks for all the great ideas for mosquitoes. They seem to just love me. Thank you for this recipe. I spend summers here in MN and the mosquitoes find me super tasty! I am going to have to try this. I wonder if it works if you use the separate oils instead of that blend as I think I have all of those essential oils. My friend in MI said she found a recipe on the internet – I think it might have a little lemon juice in it – and she sprays is around her deck and it keeps them away according to her. Perfect timing! We have mosquitos and now we have these little nats (that doesn’t look right). Knats? nats? I am so going to order this oil today!!!! Fabulous ~ just what I need! I live in south Texas and the mosquitos are out in force. Hi! Thanks so much for stopping by the Wednesday Roundup! This awesome post is being featured this week! Come on by and grab a featured button! I’ve also pinned this to our Link Party Pinterest board! I need to try the bug spray! Thanks so much! So, there are all these fantastic ways to keep mosquitoes off us, but what about ticks? Most of these natural repellents don’t phase them in the least, and sometimes even permethrin doesn’t work. Let’s not forget how toxic it and other chemical repellents are. So, got any ideas? My only way to repel those flying vampires away my body is Skin-So-Soft by Avon. Trust me, I’ve tried many things. I take a cotton ball dap into my bottle really soak that ball good and hit all the parts where the vampire will strike on me. I’m ready enjoy my gardening or just playing in the dirt. My allergy against these flying vampires started many years can’t tell you how many times they nailed me with bites that turned into huge welds. Did they itch? I wanted to itch away my skin. I tried everything vinegar, alcohol, but NEVER Deet too many deaths heard there and wasn’t going to make their list. Yes, boys and girls the best product is on the market and work miracles. I can go outside and enjoy planting, cleaning out my garden, any lawn work without the fear of being bitten by ” Flying Vampires”!!! I hope I help someone like me out. If you click the links that are located in the post it will take you directly to the place to order. Is this toxic to birds? Could I put in my bird bath? An allergist suggested vitamin B1 for my son. I’ve been using it since the 70’s. The vitamin emits an odor on your skin that repels the mosquitos. But, undetectable by human nose. You are purchasing an essential oil that contains bug repelling plants and turning that into a bug spray. So you aren’t actually buying a bug spray, you are making one with essential oils and witch hazel. If you prefer to buy the oils separately you certainly can but I suspect that might add up quickly. I would recommend buying peppermint, citronella, lemon, rosemary and eucalyptus. Your comment about being chemical free is misleading. All of those things are chemicals. What you need to say is that it doesn’t have any dangerous chemicals in it. Everything is a chemical of some sort.